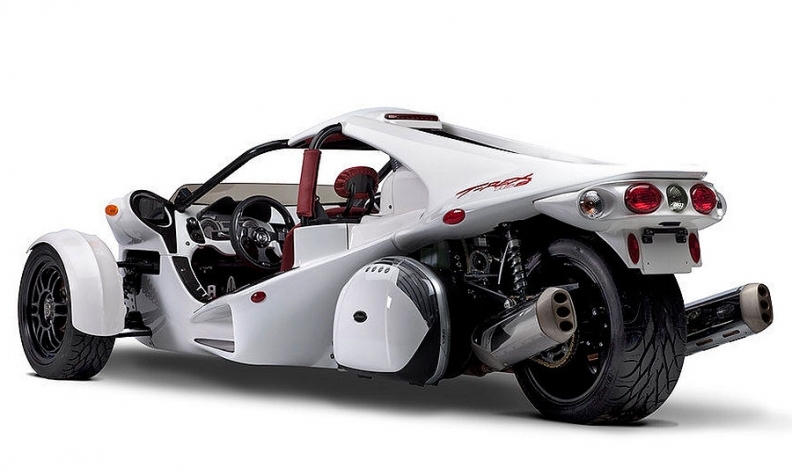 Campagna Motors calls the six-cylinder-powered T-Rex a “legal rocket.” Well, it wasn't legal in Ontario, but it will be. The landscape of vehicles in Canada just got a little more interesting; with one less wheel, but perfectly legal. Ontario recently changed its legislation, launching a 10-year pilot program that allows three-wheeled vehicles onto its roads. You could hear trike riders in Quebec, B.C., Manitoba and the Yukon rejoice; Ontario’s move brings it into line with similar legislation in those provinces. The three-wheeled vehicles are different than three-wheeled motorcycles. They have steering wheels and controls like a car as well as passenger sit-in seats and drivers only need a “G” licence to drive one. For the uninformed, the choices are interesting. There is a 2.4-litre 173-horsepower Polaris Slingshot for $26,000 that goes from zero-to-100 km/h in less than five seconds. Bombardier sells the made-in-Canada Can-Am Spyder, sought after by long-distance touring riders. Or there’s something more extreme such as the $57,000 T-Rex. This one is made in Quebec and is characterized as a “legal rocket” by the company’s owner at Campagna Motors. The company has a new deal this year with BMW to buy 1.6-litre six-cylinder engines and transmissions for the T-Rex GT model. The T-Rex weighs less than 500 kilograms. Ontario residents certainly have interesting choices for the road, at least in summer.